As the word “programmatic” indicates, you likely have a hunch that programmatic advertising is some form of automated process. Bingo! Today, many advertisers are still following the traditional high-touch method to manage and track digital media buys. This involves the Insertion Order (a.k.a. IO purchase order) flowing from the advertiser to the developer through multiple touch points like phone calls, faxes, emails, etc. To bring more efficiency, programmatic advertising enables the order and revenue flows from advertisers to developers through automated means, and ad tech plays a key role in streamlining transactions. Programmatic buying not only streamlines transactions, but allows simple economic theory to exist. An easy way to understand programmatic buying is to think about the stock market. The value of each share is determined by the level of scarcity, and more importantly by a simple supply and demand curve. In the case of programmatic buying, the same rule exists for media inventory. Similar to the stock market, programmatic deals include an element of competition, as at any given time multiple advertisers are bidding on the same set of users (or impressions) in a certain app. 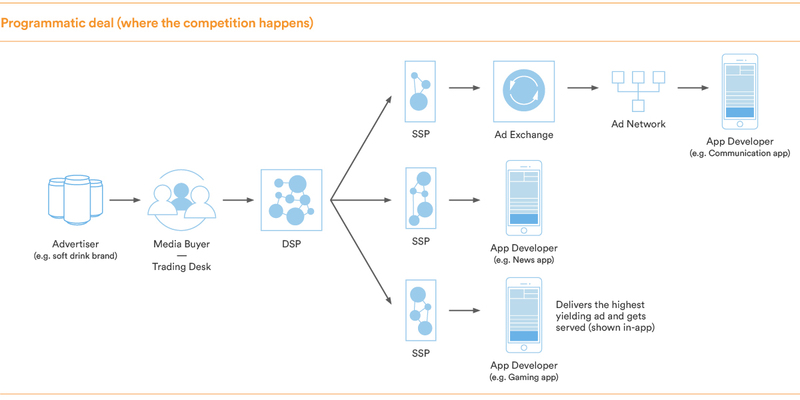 Developers benefit from the competition because the algorithms that ad tech platforms provide can also help select the most relevant, highest bidder in real-time to maximize revenue opportunities. On the other end, there are always multiple sites or apps that may fulfill an advertisers’ need for a specific audience. This is a great benefit to advertisers as programmatic deals are traded at volume, and they can access their target audience at scale and deliver their campaign at the right time with precision targeting. Next week in Part 3 of this guide, we’ll cover how real-time bidding (RTB) works. Stay tuned! In the meantime, if you have any questions about Fyber, feel free to contact our experts here.